Popup Maker integrates directly with the Contact Form 7 (CF7) plugin to allow plugin users to set a browser cookie on form submit. The cookie prevents a popup that contains the form from displaying again after the form is successfully submitted. The option settings box labeled 'When should your cookie be created?' will open. Select the drop-down menu options to view the cookie options. 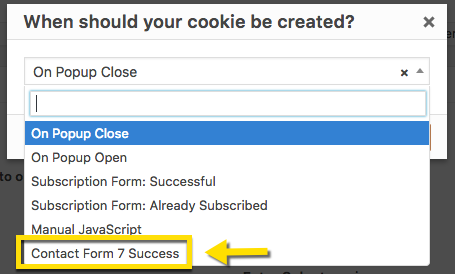 Select the 'Contact Form 7 Success' option and then select the 'Add' button to set the option. Follow the remaining prompts within the option settings box to either add or update the cookie option setting. The following videos use an older Popup Maker Admin interface ( before version 1.7+ ). However, the process to set and link a trigger with a cookie remains the same in the current version of the plugin. The example videos in this section demonstrate the link between a trigger and a Contact Form 7 Success cookie. Access the "Close Popup" Action when you build your form inside the Contact Form 7 module, as seen in the following video. If you want your users to see your "Success" message, make sure to set a delay (milliseconds) in the Contact Form 7 plugin options that is long enough so they can read it. The Contact Form 7 plugin allows users to set and display a success message after form submit success. The success message is set and managed within the form plugin itself, not Popup Maker. Popup Maker adds 'Close Popup' and 'Open Popup' options on the Contact Form 7 'Popup Settings' option tab. These options allows plugin users 2 ways to display a confirmation message after form submit success. See the related article link below for details.